I’ve said it before and I’ll say it again, I love plane food. Most people look at me like I’m stark raving bonkers when I say it but I feel that I have a pretty good argument. I’ll always choose a meat dish because I know it’s going to be tender, never dry and always packed full of flavour. And the reason for this is that during the process of cooking and storing before it makes it to your tray, the meat has time to marinate and soak up all of the flavour. Before my trip to Hong Kong, I had only ever travelled in economy class. And although I can’t say I’m ever totally content in the comfort stakes, the food is always spot on – bar that time I had to endure a glutinous dish of pork congee for breakfast on a flight to Australia because there were no omelete’s left! So the first thought that entered my head when I was told that I would be flying Business Class with Cathay Pacific to and from Hong Kong was the food. Then came the excitement about being able to recline the seat to make into a bed and actually sleep, not to mention the in flight entertainment system and extra large TV screen. But before business class customers even reach their seat, they get to enjoy the perks of the lounge in the airport. It had never occurred to me before that while I was sitting in the uncomfortable, noisy and packed airport waiting lounges, making pointless visits to duty free and spending money that I really shouldn’t be, the more ‘privileged’ out there were enjoying the serene lounge whilst helping themselves to drinks, sitting on comfortable sofas with free WIFI and eating noodles to their hearts content. When we arrived at Heathrow Terminal 3, I was so desperate to get a piece of it that I ran straight past duty free and all of my usual pit stops to take advantage of the lounge. Despite having just enjoyed afternoon tea at Grand Imperial, I headed straight to the noodle bar, pressed the bell and waited for the chef. He took my order, gave me a buzzer and told me to come back when it flashed. 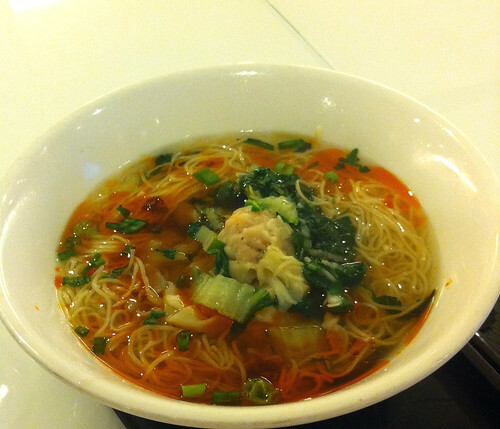 When I arrived back at the counter, I was presented with a large bowl of steaming prawn and chicken wonton noodles. I told myself that I would only have a few mouthfuls as I wanted to save myself for the feast on the plane but literally 5 minutes later, I was slurping up the last of the noodles and saying ‘oops’. Fresh and cooked to order, this was just what I needed to get me in the mood. After being greeted by the extremely preened and porcelain skinned air hostesses as I boarded the plane, I sank into my chair and immediately analysed my surroundings. After getting settled, my eyes caught sight of a button marked with squiggles. I pressed it and was surprised to feel a faint massage on my lower back. As I pressed the arrows that surrounded the squiggled button, the direction of the massage changed. By this time my face was beaming. They say it’s the small things… As we took off, my feet perched on the foot rest in front of me, I smiled and took a sip of champagne knowing that I was in for a good trip. 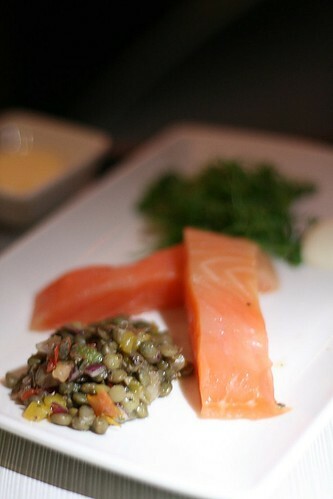 As I listened to the clatter of proper cutlery and plates in the background, I enjoyed my starter of Loch Fyne cured salmon loin with puy lentil salad and lemon cream fraiche with a ‘Pacific Sunrise’ cocktail, a Cathay Pacific signature drink of champagne and Drambuie with orange and lemon zest. I chose braised pork cheek with mustard mashed potato, savoy cabbage, carrot and roasted shallots for main and sipped a glass of crisp Mount Riley Sauvignon Blanc with it. 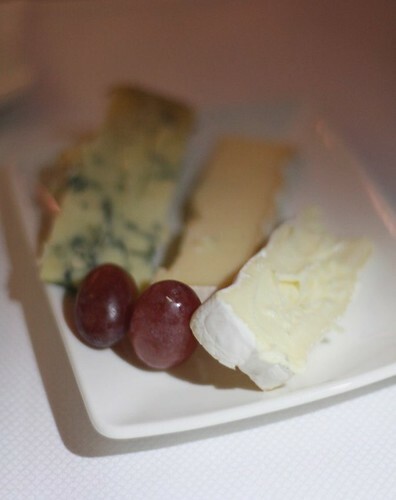 Thinking that you had to opt for either a cheese board or chocolate and orange cake for dessert, I ordered the cheese and was served three small wedges of French brie, Cropwell Bishop Stilton and St. Nectaire and a few crackers. I didn’t realise that we would also be offered a slice of chocolate cake to finish but duly accepted and polished it within minutes. The cake was the only part of the meal that didn’t impress – but I’m a hard one to please when it comes to sweets. After dinner, I reclined slightly to watch a film before popping my ear plugs in, pulling my blind fold over my eyes and reclining my bed flat to go to sleep. During the eight hours that I was down I woke up several times – too hot, too cold, ‘Are we nearly there yet’? But when I eventually arose from my slumber, there was a mere half an hour left of the flight. I was disappointed that I had missed breakfast but sleeping through was definitely wise. Although I felt slightly hazy for the first day or two, I mostly managed to escape jet lag on the way out to Hong Kong. Perhaps it was the excitement and constant activities that kept it at bay. And although I wasn’t exactly in a hurry to return to England, I was thoroughly looking forward to the return trip. One particular event in the hours leading up to the flight back home stood out as a highlight of my trip. We were able to enjoy the first class lounge and we made sure that we arrived at the airport with plenty of time to spare. Having been told on our way to the airport that we could enjoy a bath, a member of our group almost jumped out of his seat at the thought. The group had unearthed what was (I believe) a previously unknown (even to him) obsession with all things bathroom related. Taps, baths and general relaxation in the water seemed to be a big topic of conversation. The two of us even strangely happened to end up on a road in Causeway Bay that just housed shops selling the largest array of bathroom fittings. He didn’t say it but I have a feeling he might have been in heaven. Perhaps he even meant to end up there, but he didn’t let on. Hong Kong airport plays host to no less than five Cathay Pacific lounges for Business and First Class customers – The Cabin, The Pier, G16, The Arrival and The Wing. 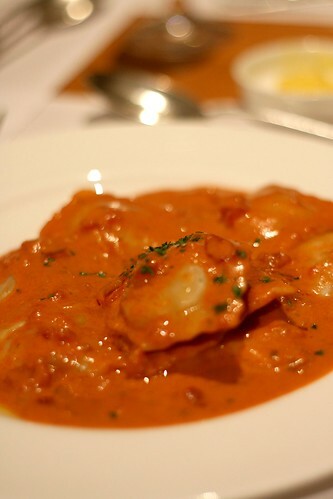 We headed straight to The Wing to enjoy a spot of dinner from the buffet and one of the best plates of ravioli I’ve ever had before I stopped off for some me time in The Cabanas, one of five lavish bathrooms available to allow customers to relax before the flight. 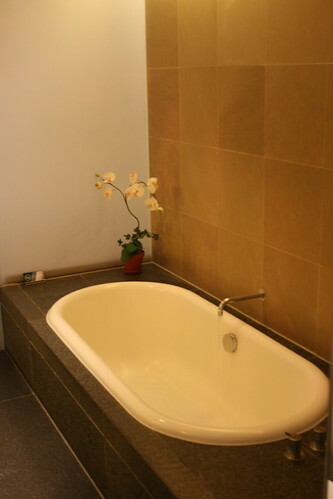 After my ‘light snack’, I raced to the bathroom with a glass of champagne in hand and gasped when I entered the dimly lit room, which contained a large bath, a shower, a sink and a myriad of plush toiletries. The sliding door of frosted glass that stood at the end of the room looked out onto a pebbled walkway. I almost walked out and round to see what was beyond the two sun beds directly outside my room but stopped at the sound of a fellow bather swishing their bath water – the walkway was shared between all of the cubicles. That could have been embarrassing! After a relaxing soak, I joined one of the members of my group, who had also enjoyed a bath, for another glass of champers. The non bathers had gone to visit another lounge but one member of the group was missing. Can you guess where he was? Not wanting to leave without him, we asked the staff if he had left his cubicle. Not knowing, they offered to put an announcement out on the tannoy. What service! Shortly after the announcement had been made, he ran out, slightly disheveled and confused to find us sitting waiting for him on the sofa. His anger quickly subsided when he realised that there was no real emergency and that it’s rather flattering to have an announcement put out for you. Shortly after, it was time to say goodbye to Hong Kong and board the plane, although I could have happily stayed in the lounge for a few more hours. Earlier in the day, we had been treated to a visit to Cathay City, the airline’s headquarters. A short bus ride away from the airport, Cathay City was built on four hectares of unclaimed land next to the airport and is used to serve over 3,000 staff in Hong Kong. We arrived at a classroom for a talk by Charles Grossrieder, catering manager and Clara Yip, catering manager for wine, beverage and catering supplies. The food and beverage aspect of a flight is extremely important in Asia, which is why, as of the beginning of November for three months, Cathay Pacific has partnered with Swire Hotels to launch a new in-flight promotion. Business and First Class customers are able to enjoy dishes on the menu from the likes of Café Gray Deluxe (Michelin 1 star), Feast (Food by EAST), Sureño and Bei. Our Business Class menu featured a main from Café Gray – Braised duck leg a la Boulangere, sherry wine, soy and parsley. It was very rich but delicious and the meat literally fell off the bone. For the next three months, more than 30 dishes created by chefs from each restaurant will appear on the menus. 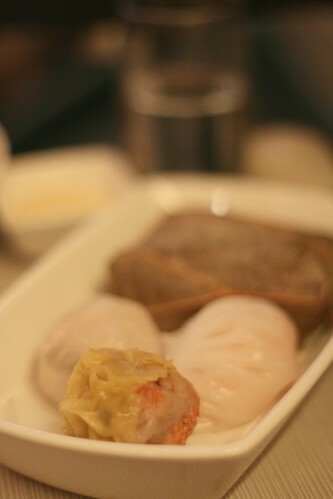 Although I had a modern European classic for my main meal, I made sure I opted for the Dim Sum at breakfast, heaving learned that the airline is always striving to improve their Chinese cuisine. Every two years, the airline trains chefs in basic Chinese food practices, based on Chinese food that can be made anywhere in the world. And if you’re ever worried about food hygiene on the plane, don’t be. Hygiene standards for airlines are some of the highest in the world – during transit the food must never go above 7 degrees and is always kept at 4 degrees or below in the holding room. Salads are prepared roughly 36 hours and mains 72 hours before reaching your tray. One hot topic was the question of whether our taste buds really don’t work as well when we are so far up in the air. I remembered watching a programme fronted by Heston Blumenthal a few months ago and he was investigating the blandness of food 30,000 feet up in the air. But Charles dispelled this rumour and proceeded to tell us that the airline does not feel the need to over season the food. All customers are provided with their own salt and pepper pots – you can always add salt, but you can never take it away. The airline prefers natural flavours so chefs are encouraged to marinate the meat so the flavour comes naturally. Wine is also a huge part of the flight. A tasting panel of three meets around 4 or 5 times a year and any wine in the world has a chance of joining their supplier list. A blind tasting is conducted in Hong Kong and the best wines make it to the menu. They work directly with the wineries, which is the first real test. If the wine makes the journey from the winery in good condition, they have a higher chance of making it onto the menu. 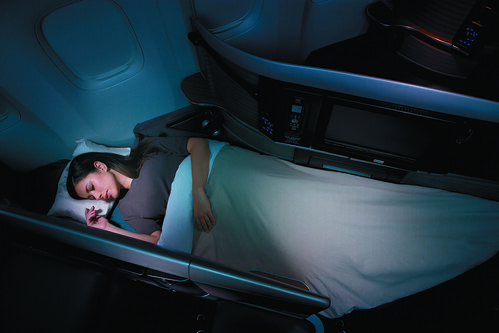 I adored travelling in business class and it’s going to be pretty hard when I have to go back to economy. But maybe not all is lost. Cathay Pacific plans to introduce a premium economy section on its fleet next year and the new seats will have a further recline and plenty more leg space than regular economy. But it’s not just the seats that will improve; the meal service will also include a few added extras. As someone who can’t afford to regularly travel business class, I’m excited by the prospect of being able to upgrade slightly for that extra bit of comfort. But for now, I’m quite happy for the memories of business class to linger until my next long haul flight… whenever that may be. Food For Think was a Business Class guest of Cathay Pacific. I was surprised that the answer was ‘no’ – I can’t tell a difference to be honest. All of the food was delicious. Great review. Flying business is amazing. Have only done it a couple of times but it makes economy so painful! Sleep is still very fretful though – you get so hot but can’t undress! Have a business class trip to Tokyo on ANA coming up soon, hoping the Asian hospitality is there too! TPT. Great insight into how the other half does it. Sounds entirely civilised. I have been browsing on-line greater than 3 hours as of late, yet I never found any attention-grabbing article like yours. It’s beautiful price sufficient for me. In my view, if all site owners and bloggers made just right content material as you probably did, the internet shall be a lot more useful than ever before.